Metamucil is sold over the counter and is generally recommended for everyone, but some side effects may be experienced. Most of these side effects are common and will not disrupt a person’s normal functioning, and they can include conditions like bloating, upset stomach, and nausea. In some rare cases, serious side effects may occur, the most of which are the result of an allergic reaction. An explanation of some of these side effects, both common and serious, is discussed below in order for patients to understand all possible risks associated with this medication. The absorption of essential proteins, vitamins, and minerals may also be hindered when taking a product that contains Psyllium, such as Metamucil. A high intake of dietary fiber can negatively affect how these nutrients are absorbed within the intestinal tract. A fiber supplement can decrease this absorption by lowering the amount of minerals by creating more stools, decreasing time of transit, and trapping minerals in the stool, which later leave the body. This could be of particular importance to people who are not meeting the nutrient and mineral needs of their body. Metamucil works well as a laxative because when it is mixed with water, the psyllium will thicken and create a semi-solid mass. This mass then helps to push the bowels through the digestive tract and intestines. However, this swelling can create an additional risk of choking or intestinal blockage if it is not appropriately taken with enough liquids. To prevent this type of side effect, it is especially important to take Metamucil with a full glass of water and to drink at least six to eight additional glasses of water throughout the day. If a person has trouble swallowing or problems involving the narrowing of the esophagus, they should not take this medication, as their risk of choking or intestinal blockage will be higher than normal. 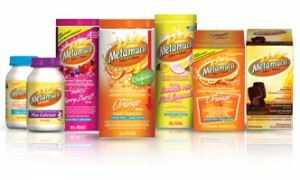 In general, Metamucil is a safe supplement that relieves constipation and other abdominal issues. However, like most drugs, it can also have side effects. Some of these side effects may be common and will not disrupt a person’s normal functioning, while others can be much more serious and need immediate medical attention. Special considerations should also be taken when patients are pregnant, breastfeeding, using other medications, or are susceptible to choking in order to avoid additional adverse health risks and Metamucil side effects.